This expression generates a walk cycle for a character. You can simply keyframe the position of the character and the feet, hands and the body move automatically accordingly to make the character walk or run. The character will also walk if you move the ground that he is walking on. You first need to setup a skeleton for your character with the IK iexpressions. Then the walk cycle expression needs to be applied to the goal layers of the two feet, the goal layers of the to arms (to swing the arms in sync with the movements of the feet) and the layer representing the body center to move the body a bit up and down in sync with the walk cycle. The expression has built-in generic animations for walking and running, but you can also use it with your own custom animations. is the name or index of the layer containing the left foot goal. is the name or index of the layer containing the right foot goal. is the name or index of the layer containing the left hand goal (if you want to move the arms in sync with the feet). is the name or index of the layer containing the body (which will be moved up and down a bit while walking). is the name or index of the layer containing the body (the exact position of this layer does not matter - only the relative movement of the body layer w.r.t. this layer is used to recunstruct the number of steps that the character walked). use your own walk cycle by linking the walk cycle to your own custom animations. the frame where your linked custem loop starts. the last frame of your linked custem loop. HOw many pixels the character walks in one loop. Don't put a number here. Use the link button to link here the position of the left foot of your custom walk cycle. Don't put a number here. Use the link button to link here the rotation of the left foot of your custom walk cycle. Don't put a number here. 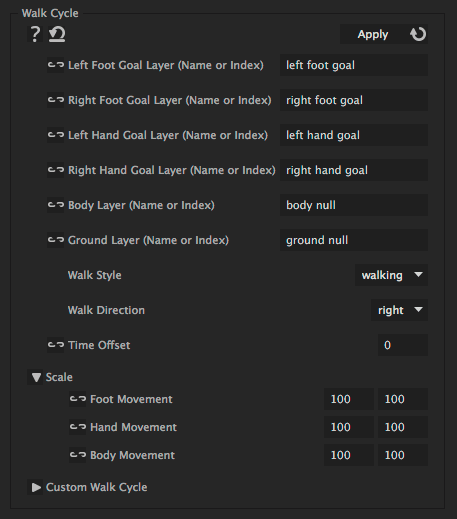 Use the link button to link here the position of the right foot of your custom walk cycle. Don't put a number here. Use the link button to link here the rotation of the right foot of your custom walk cycle. Don't put a number here. Use the link button to link here the position of the left hand of your custom walk cycle. Don't put a number here. Use the link button to link here the rotation of the left hand of your custom walk cycle. Don't put a number here. Use the link button to link here the position of the right hand of your custom walk cycle. Don't put a number here. Use the link button to link here the rotation of the right Hand of your custom walk cycle. Don't put a number here. Use the link button to link here the position of the body of your custom walk cycle. Don't put a number here. Use the link button to link here the rotation of the body of your custom walk cycle. adds the keyframed value to the value of the walk cycle. This allows to modify the animation with keyframes on top of the walk cycle, but in order to obtain the original walk cycle, you need to set the value to (0,0) before applying the iExpression..